Earwigs are interesting insects that have a fearsome reputation. A very old rumour that's still circulating says that earwigs enter people's ears, burrow into their brain, and lay their eggs there. Earwigs have a large pair of pincers at the end of their abdomen, which makes them look very dangerous and adds to their threatening image. The abdomen is flexible and can be curved, allowing the insect to aim its pincers where it wishes. In reality, earwigs don't enter the brain and aren't dangerous to humans. They may sometimes be garden pests, though, and they occasionally enter homes. 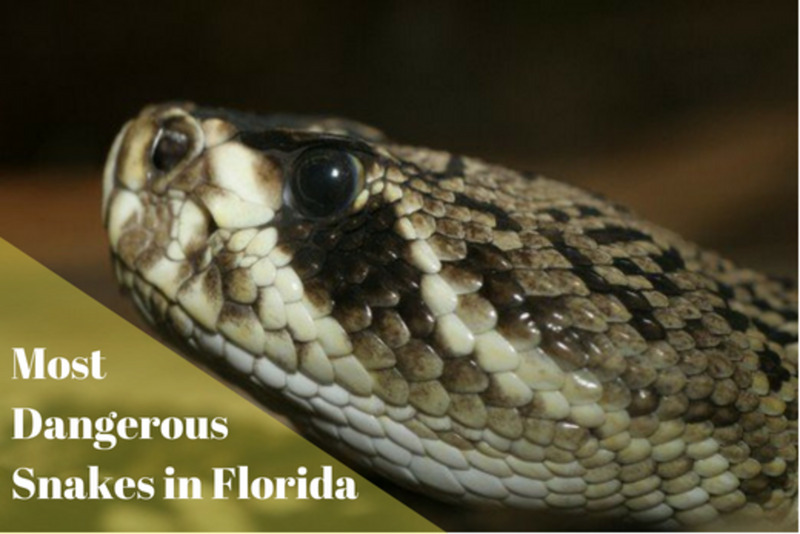 They are nocturnal insects and hide in dark, moist crevices during the day. 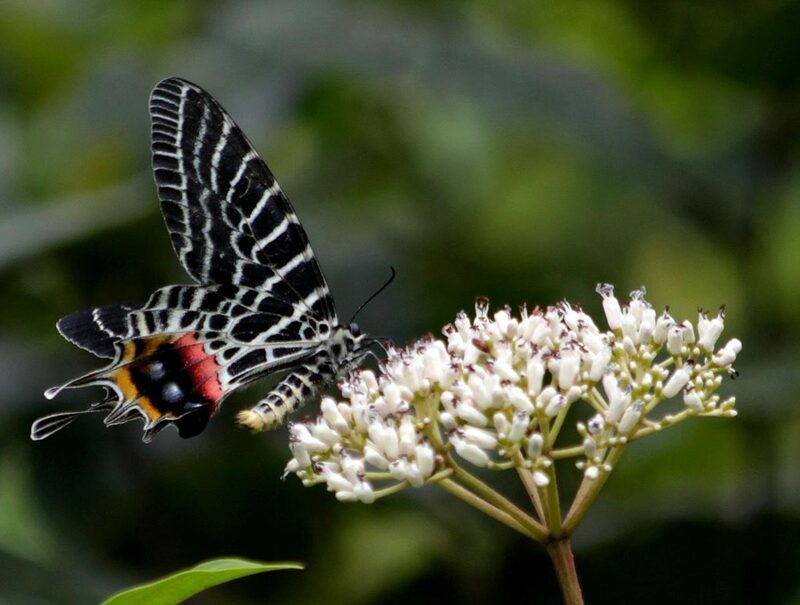 At night they follow a omnivorous diet, feeding on other insects and plants. Many earwigs do have wings, but they rarely fly. Earwigs have a widespread distribution and are found in North and South America, Europe, Asia, Africa, Australia, and New Zealand. 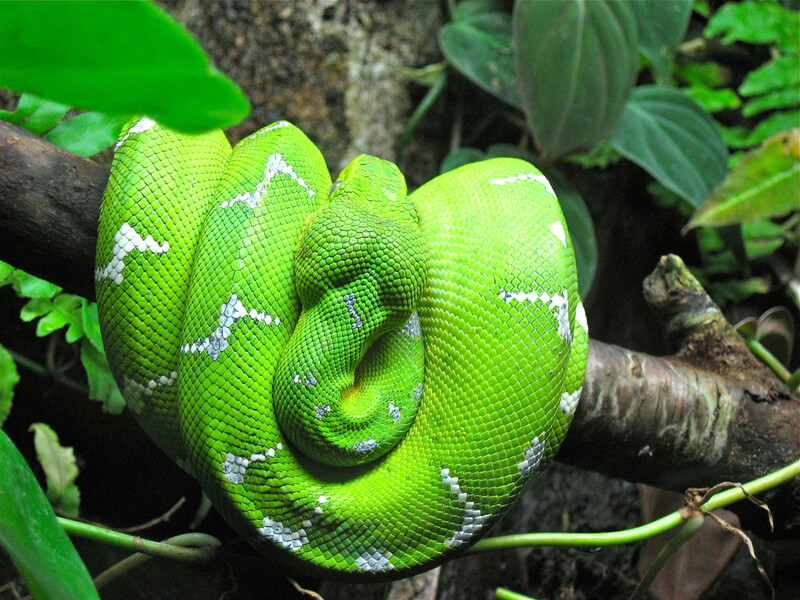 They are most common in tropical areas but also live in temperate climates. Earwigs are small creatures. The giant Saint Helena earwig was as long as 3.3 inches, however. This insect lived on the tiny island of Saint Helena in the South Atlantic Ocean. Unfortunately, it was declared extinct in November, 2014. Its demise was caused by habitat destruction by humans and the introduction of predators. Insects have three body sections—a head, a thorax, and an abdomen. An earwig has two long antennae on its head, three pairs of legs on its thorax, and a pair of pincers, or cerci, at the end of its abdomen. The cerci are curved in the male and have teeth-like structures. They may also be unequal in length. The female has straight cerci without teeth. The cerci are believed to play a role in trapping prey, attacking enemies, mating, and the folding and unfolding of the wings. They are too small and weak to seriously wound humans. A person may experience a pinching sensation if an earwig attacks them with its cerci, however. An earwig has two pairs of wings. When they are folded up on top of the thorax they are hard to see. 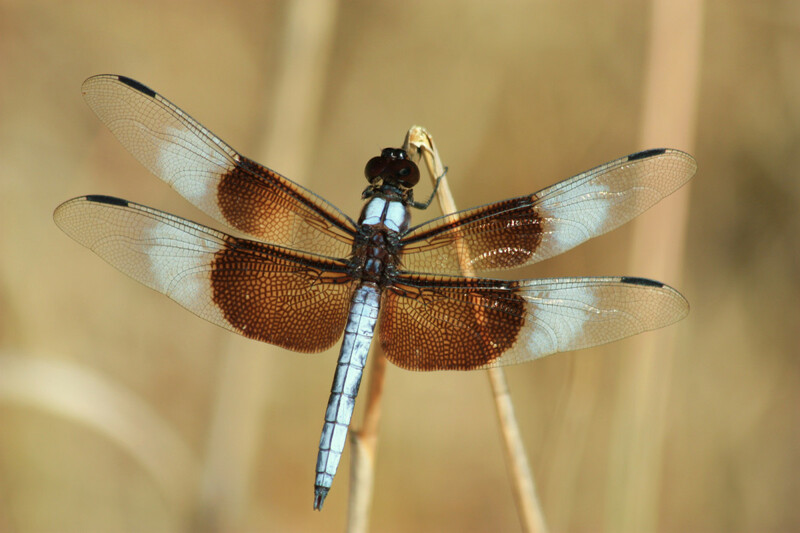 A tough pair of outer wings, or forewings, covers the more delicate inner wings, or hind wings. The inner wings can be used for flying. 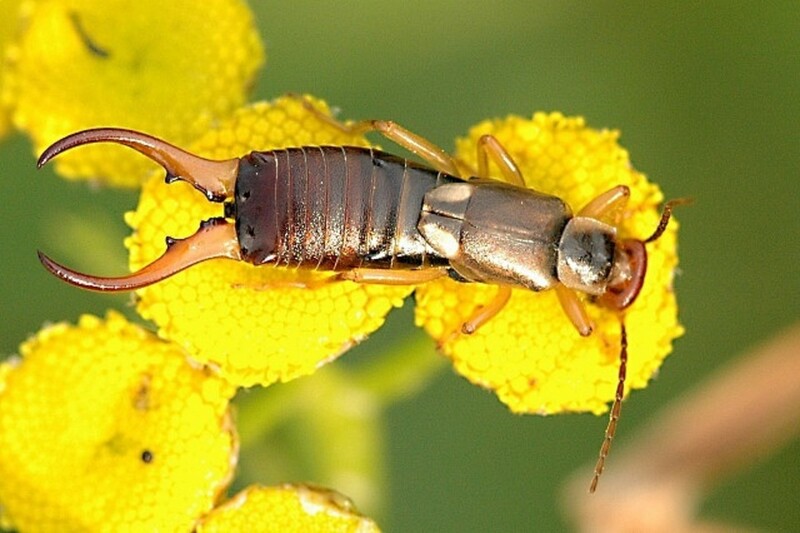 The European earwig (Forficula auricularia) is native to Europe but was introduced to Seattle in the United States in about 1907. From there it spread to other parts of the country and into British Columbia in Canada. Though there are other earwigs in North America, the European earwig is one the most abundant species and is most likely to damage gardens. The insect is about three quarters of an inch long and has a flattened, red-brown body. It can fly but very rarely does so. Some earwigs—including the European earwig—release a yellow-brown liquid from scent glands in the back of their abdomen. This liquid has a very unpleasant smell which is usually described as "foul". The release of the liquid is a defence mechanism. The earwig hides in a safe place during the day. It may find shelter under a piece of loose bark or a rock. It may also hide inside a piece of fruit, a flower, leaf litter, mulch, compost, a crack in a piece of wood, or a wood pile. The animal likes moist but not wet areas. At night it emerges to feed on insects and plants. It feeds on dead materials as well as living ones and is both a scavenger and a predator. European earwigs mate in the autumn. After mating, the female builds a burrow just below the soil surface. She spends the winter in the burrow. The male spends the first part of the winter with the female and then either leaves or is driven away. The sperm survive the winter inside the female's body. In the spring, the female lays up to sixty creamy white eggs. She takes care of her eggs, protecting them from danger and keeping them clean. If the temperature drops, the female tries to keep the eggs warm by taking them into deeper soil. She even takes care of the young earwigs for a while once they're born. The youngsters are known as nymphs and are white when they begin their lives. The nymphs moult four to six times before they develop their final adult form, becoming larger after each moult. 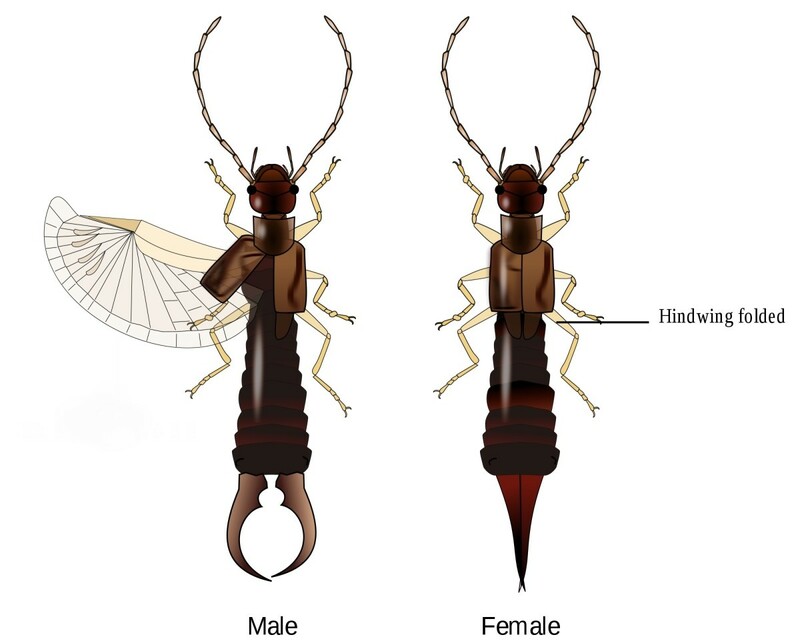 A female European earwig lives for about a year. The male may die during the first winter of his life. The derivation of the word "earwig" is unknown. The name may refer to the belief that the insect enters ears. Alternatively, it may be derived from the ear-like shape of the hind wings when they're expanded. In the latter case, the word "earwig" may be a corruption of the term "ear wing". Earwigs definitely don't burrow into the brain, and they definitely don't lay their eggs inside our bodies. It may not be true to say that earwigs never enter human ears, however. They do look for dark, sheltered places to hide, so it is conceivable that they could enter a sleeper's ear if the person is sleeping in an earwig habitat. (Other insects may do the same thing.) This is almost certainly a very rare occurrence, though. Earwigs can sometimes be helpful in a garden. They eat annoying pests like aphids and mites and they also eat insect eggs. When there are many other insects available for food, earwigs are generally less attracted to plants. Sometimes earwigs do attack plants and become pests themselves. They seem to prefer young, actively growing plants. Seedlings and immature plants, leafy vegetables, flowers, soft fruits, berries, and corn silk may be severely damaged by earwigs. Since earwigs hide under leaf litter or in wood crevices during the day, removing litter, mulch, and pieces of wood may discourage their presence. This is especially important around the entrances to a home. If the outside environment is too hot, too cold, or too dry for the insects, they may try to enter the home. Cracks around windows and doors should be sealed to prevent them from getting into the building. If tidying a garden doesn't eliminate or significantly decrease an earwig infestation, natural pest control methods could be very helpful. Chemical pesticides should really be reserved for very serious and damaging infestations that can't be removed in any other way. 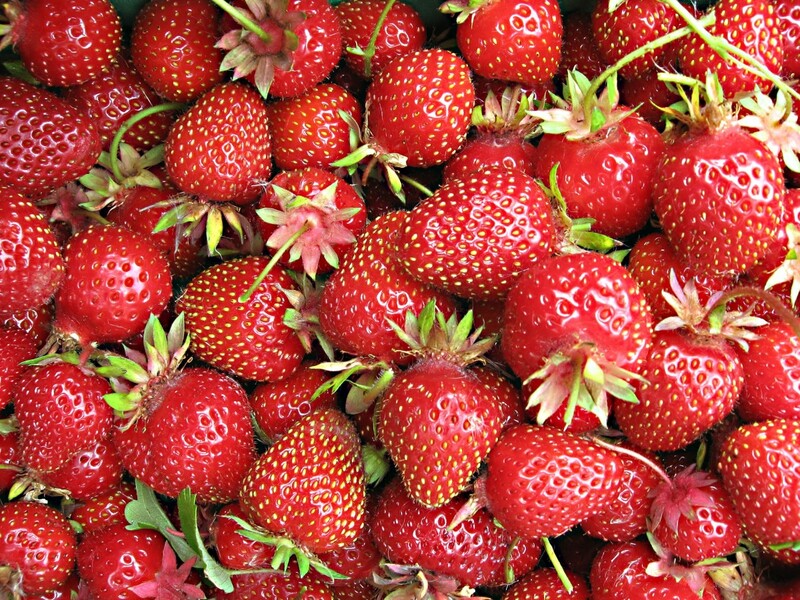 The toxicity of most pesticides to non-target species—including humans—is worrying. An empty plastic food container can be used to make an oil trap for earwigs. Yogurt, sour cream, and cottage cheese containers are all suitable. A metal can may be used instead of a plastic container. About an inch of cooking oil should be placed in the container. The goal is to get the earwigs to fall into the oil. 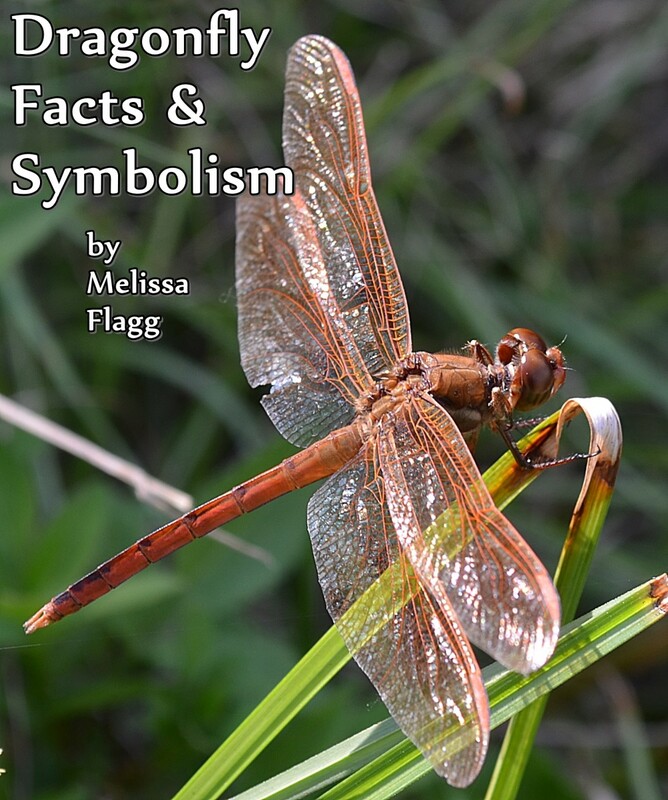 The openings to an insect's breathing tubes are located on the side of its body. The oil will block these openings and suffocate the earwigs. A liquid with an enticing odour should be added to the oil to attract the earwigs. The liquid from canned fish or from canned cat or dog food works well. The lid should be placed on the oil container to prevent other animals from getting to the oil. Holes will have to be punched in the lid and perhaps around the side of the container under the lid so that earwigs can enter the trap. The trap can then be buried in the soil up to the level of the side holes so that it's easy for the earwigs to enter. The trap should be inspected regularly and the dead insects removed. During the day, earwigs seek a shelter for protection. Rolled up corrugated cardboard makes an attractive shelter for earwigs and can act as a trap. 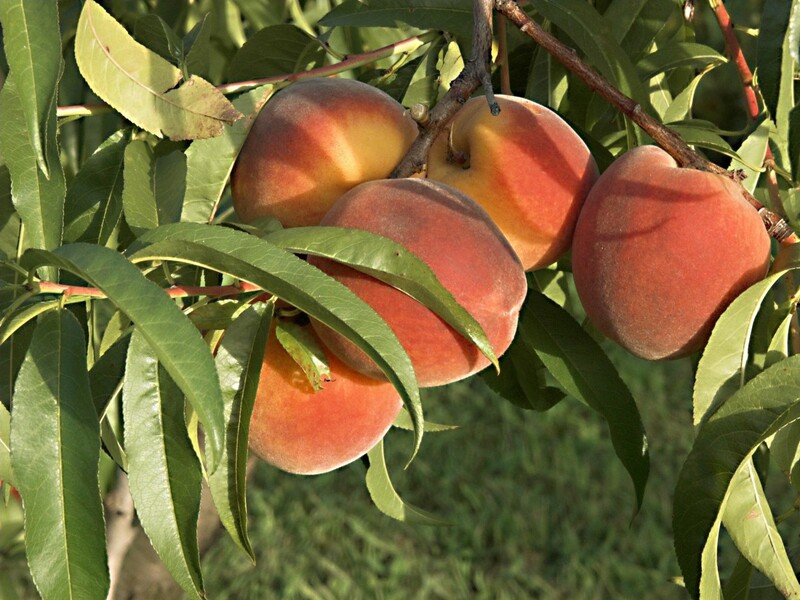 The rolls can be secured with an elastic band and then tied around the trunks of fruit trees. Crumpled, moistened newspaper makes a good shelter, too. Bait food placed inside the shelters makes them even more attractive. Colorado State University researchers have found that wheat germ and wheat bran are effective baits for European earwigs. The insects reportedly like molasses, too. Like all insect traps, a trap made of cardboard or newspaper should be inspected regularly and emptied. Soapy water can be used to kill any earwigs that are found. Tree Tanglefoot is reportedly a very helpful product for controlling earwigs. I've never used it myself, but the entomologist in the video above recommends it. It's made of natural ingredients, including resins and wax, and doesn't contain pesticides. It works by creating a very sticky surface that traps earwigs and other insect pests. Tanglefoot traps insects mechanically instead of being poisonous. It's nontoxic to humans, pets, and insects. The above description applies to the organic version of Tree Tanglefoot. 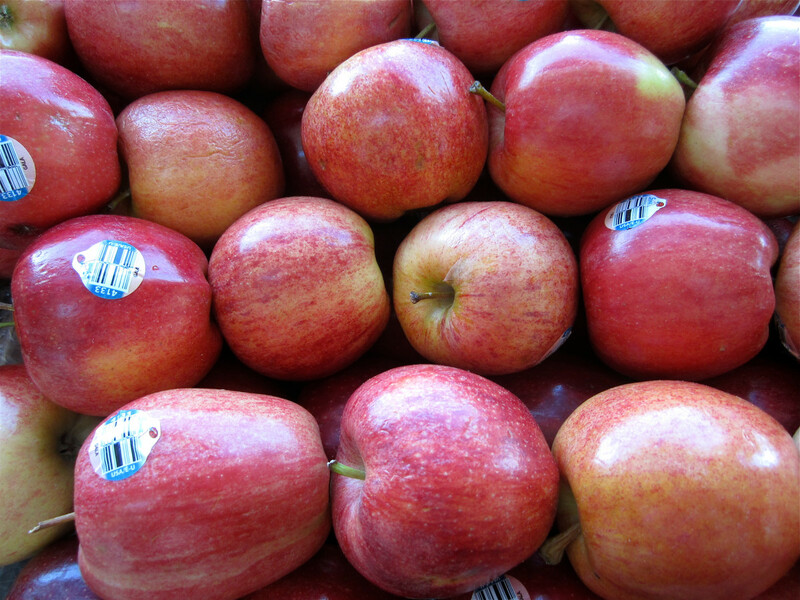 This is sold in yellow and white containers. Tanglefoot is also sold in green and white containers, which aren't organic. Tanglefoot doesn't dry out and is weatherproof. It's said to work well when it's brushed on duct tape that has been wrapped around a tree trunk. The tape makes it easy to remove the Tanglefoot at the end of the season. If the product is applied directly to tree bark it will stain it. According to the manufacturer's website, however, the stain doesn't damage trees. The product is sticky for humans as well as insects, so gloves should be worn when it's being applied or removed. In some cases, instead of being a pest, an earwig might deserve our sympathy for being a victim. The one in the video above has been invaded by a parasitic horsehair worm. When the mature parasite emerges from its insect host, it generally kills it. 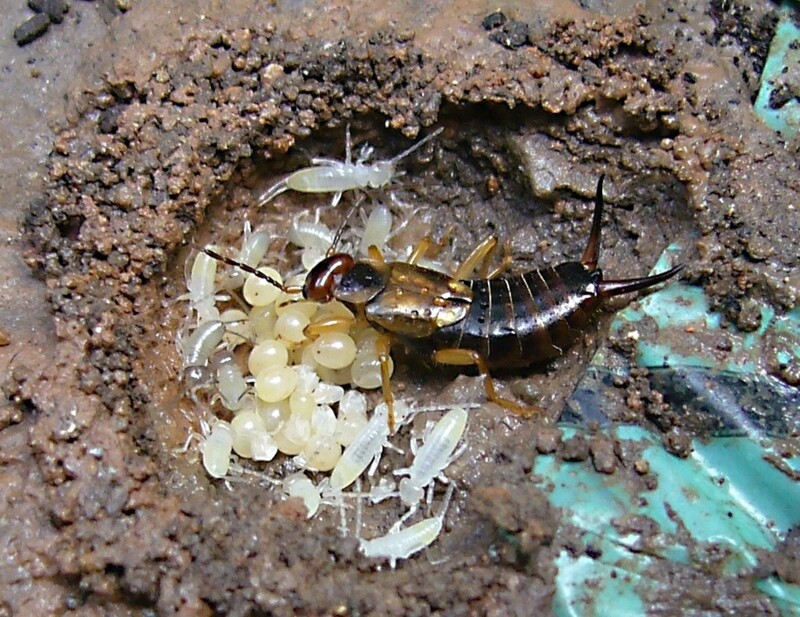 It's interesting to watch earwigs as they scurry around or as they tend to their eggs and nymphs. These little creatures may not cause any problems for humans. They may even be helpful in controlling the population of another insect. It's a shame to kill them when this is unnecessary. Unfortunately, in some places earwigs are a serious pest that needs to be removed. Luckily, many people find that natural pest control methods deal with an earwig problem very effectively. I think these are a much better choice than chemical treatments, unless the natural solutions fail to work. I appreciate your visit, Peggy. Horsehair worms are interesting creatures, even though their effects may be unpleasant. I have never noticed any problems from earwigs in our gardening efforts in Wisconsin or now here in Houston. It was interesting reading about them. Now you should write about those parasitic horsehair worms. That is a creature of which I am unaware. It certainly looked like they were attacking that earwig in the last video. Thanks for the comment and for forcing yourself to read about earwigs when you don't like them, Glimmer Twin Fan! Bugs don't usually bother me, but for some reason earwigs have always creeped me out. Probably because of the brain myth. Interesting hub that I had to make myself read. Thanks for the comments, Rolly. I wouldn't want to sleep on the ground where giant earwigs lived, either! I quite like the little guys, but I can certainly understand why gardeners might not like them. Hi AliciaC... yet another interesting article. 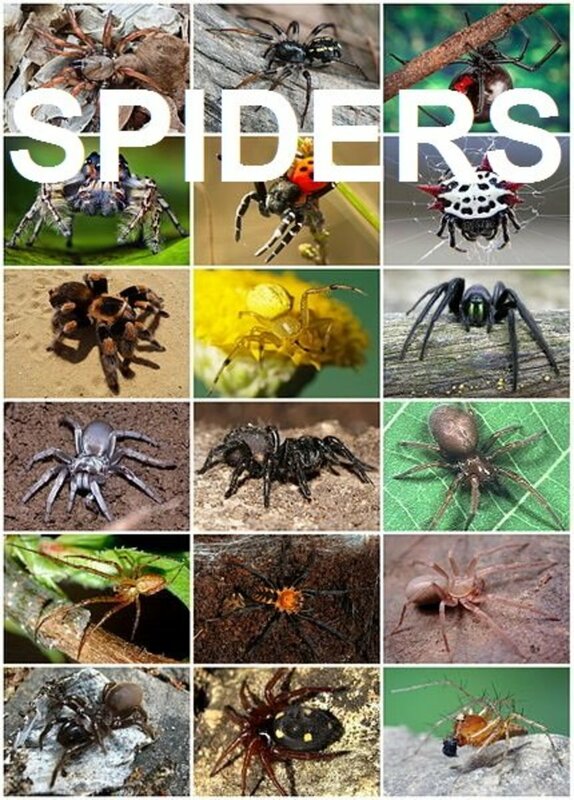 Over the years I have been around many of these little critters. At first sight fear comes into play and after observing them they are just another of these important players in the eco system we have that have been given a bad wrap. Hi, drbj. Many people seem to dislike these insects! Strangely, I saw an earwig in my garden today. I haven't seen them there for a long time. I will be inspecting my garden very carefully for a while! I will probably not be visiting that remote island of St. Helena soon, Alicia, now that I've learned from you that the earwigs there are more than 3 inches long. Like Billy above, they gross me out! Thank you for the visit and the comment, Deb. In many places it's the time of year when earwigs start to become noticeable and gardeners are thinking about control methods. I didn't realize that they were in such hordes. Good solutions, though. Thank you for the comment, Martin. Well researched. Thank you for this. Thanks for the comment, MJennifer. I don't know anyone who actually likes earwigs, although some of my relatives have a neutral attitude towards them. I'm sure I'll feel differently about them if they ever form an infestation in my garden, but at the moment I find them interesting little creatures! Interesting hub, Alicia. I'm normally pretty insect-friendly, and I find most of them fascinating. I'd never really contemplated the lowly earwig, though. I always had a minor aversion to them, passed down to me from my own mother, who despised them and considered them "filthy" insects. I enjoyed learning more about them through your hub. You're right about the bias against them -- they need a better lobbyist! Hi, Vicki. Thank you very much for the visit and the comment. It seems that earwigs have a big PR problem! Sorry Alicia, this is not my favourite topic. I'm with the earwig detesters, but I do appreciate your writing and your photos, although they emphasise the ugh! factor with me. 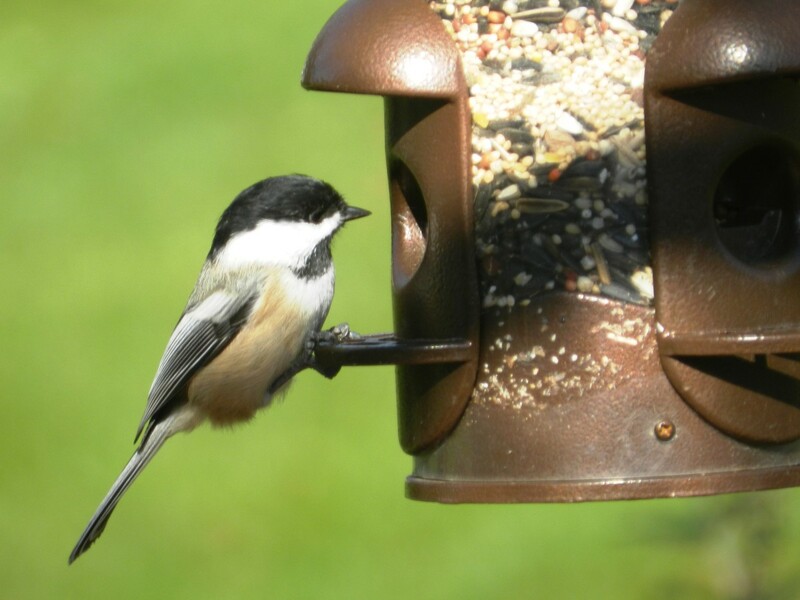 I don't think too many gardeners appreciate these little creatures. Such a shame, because they can't help how they look. Hi, Tom. I think that earwigs are interesting insects. They are very annoying when they damage garden plants, though! Thanks for the votes and the share. I appreciate your visit. Hi my friend great informative and well research article on earwigs and their habits. We have them here where i live, they like to hide under my garden hose . Well done ! Hi, Cynthia. Yes, it is strange that old myths sometimes persist for such a long time and become so widespread! It's sad when an animal is classified as a pest. It's often very important that humans win the battle with pests, especially when they cause disease or economic loss, but as you say the pests are just behaving naturally and are trying to survive. Thanks for the visit. Interesting hub on earwigs Alicia. It's funny how old myths like them laying eggs in a person's ear still do the rounds, although I bet nobody has ever met someone this has happened to. Hi, anndango. It's sad when the fight against earwigs becomes a war! They can be very annoying pests. Thank you for the comment. Hi Alicia. We don't have earwigs - must be too cold here for them. But, my mother-in-law who lives in Nova Scotia and is an avid gardener is always at war with the insect. Great hub! Thank you very much for the comment, the vote and the share, onegreenparachute! I actually felt sorry for the earwig in the last video. That's a sad way to die. It looks like I'm in the minority, because I like earwigs (unless they're acting as a pest)! I hope you have a great Sunday too, Bill. Hi, Beckie. It was brave of you to visit my hub when you hate earwigs so much! Thank you for commenting. Interesting facts, Alicia. Thanks and have a great Sunday! I despise these little creatures. I often find them in my garden and around the yard. I was surprised to learn they have wings. You would think I would have figured that out in all of these years.